MSNBC Tops All Cable Networks For First Time - Joe.My.God. For the first time in the network’s 21-year history, MSNBC finished the week as the most-watched cable network during weekday prime (M-F 8-11pm) in total viewers. According to Nielsen, MSNBC ended the week of July 17-21 as the #1 cable network for all weekday prime, averaging 2.34 million viewers, ahead of FOX News at 2.25 million. MSNBC was previously #1 in cable news in weekday prime during the weeks of May 15, 2017 (behind TNT) and September 3, 2012 (behind USA) among total viewers, but this was the 1st time MSNBC was #1 among all of cable. Additionally, MSNBC’s 7pm through midnight lineup was the #1 cable network in total viewers. Among cable news, last week marked MSNBC’s 29th weekly win (out of 30 weeks) in M-F prime over CNN with total viewers this year. MSNBC also topped CNN in total viewers in dayside (9am-5pm) and during mornings (6-9am) with “Morning Joe.” The dayside win was the 5th consecutive weekly win over CNN, while “Morning Joe” topped CNN’s “New Day” for the 30th week in a row. “The Rachel Maddow Show” (9-10pm) also bested both FOX News and CNN among total viewers for the 4th straight week in 9-10pm time period. 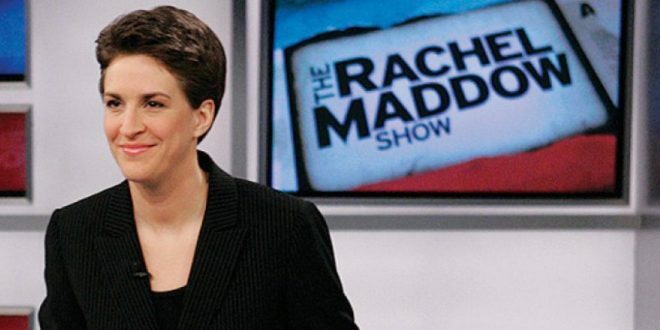 “Maddow” was the 2nd ranked show in all of cable for the week in total viewers behind WWE Entertainment.